I am quite sure that by now, most of us would have already know or read about Edward Snowden, the whistleblower who blew the lid open about the NSA. Well, spying can be hard work, and as all hard workers can tell you, they too, need a little bit of rest and relaxation from time to time. How about kicking back one’s shoes and actually taking a swig from your favorite bottle? 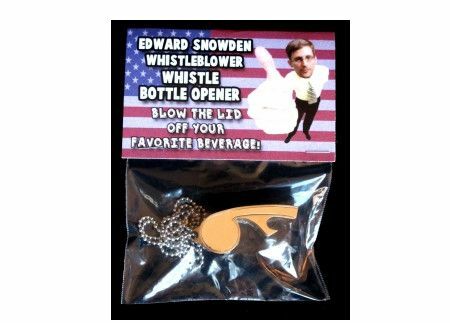 This is where the $7.95 Edward Snowden Whistleblower Bottle Opener comes in handy. Being an obvious reference that geeks will definitely be able to identify, the Edward Snowden Whistleblower Bottle Opener features a top-grade chrome whistle that is accompanied by a high-quality bottle opener that has been integrated within, while the included neck chain makes it extremely convenient to tote around. Patriot or traitor? The answer does not really matter after you have had your fair share of drinks.